Ph.D in Computer Sciences, Laval University, Quebec, Canada, 1998. 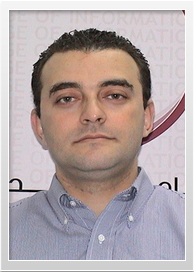 Zakaria is a Professor in the College of Technological Innovation at Zayed University, Dubai, United Arab Emirates. His research interests include Internet-of-Things, social computing, and business process management. Zakaria has extensively published in different peer reviewed journals and conferences, regularly serves on the program and organizing committees of several international conferences and workshops. He also serves on the editorial boards of many international journals. He is the recipient of an IBM Faculty Award in 2009. Programming, Software Engineering, Mobile and Cloud Computing. Zakaria’s current research agenda revolves around Internet of Cognitive Things featuring specific projects for instance, Process-of-Things (PoT), thing mutation, thing cognition, and Everything-as-a-Thing (*aaT) abstraction model. To sustain the growth of Internet of Things (IoT), different obstacles should be overcome such as diversity of things’ development technologies and communication standards, users’ reluctance and sometimes rejection due to privacy invasion, lack of killer applications that would demonstrate their necessity, lack of an IoT-oriented software engineering discipline, and finally, the passive nature of things. In response to these obstacles, several solutions are put forward and would make things proactive and responsive to the surrounding environment. This means that things can for instance, reach out to peers that expose collaborative attitude, form dynamic communities when necessary things, avoid peers that expose malicious attitude, be accountable for their actions, etc.